What flies, has no motor, and loves plastic bags ? No its not an elementary school joke...its a museum. Yes, you read it right. The Museo Aero Solar is the first ever flying museum powered by solar energy and constructed of plastic recycled bags. 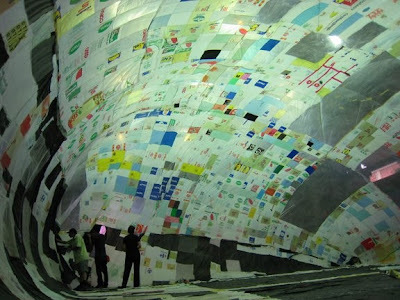 From city to city the traveling Eco exhibit moves like a nature propelled canvas, changing with each destination. 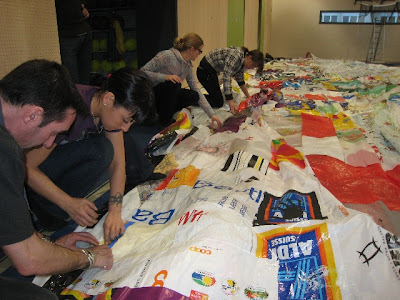 Each landing draws local participants who add more plastic bags to the exhibit, which ultimately transform the flight distance to the next destination, as well as the form of the museum itself. 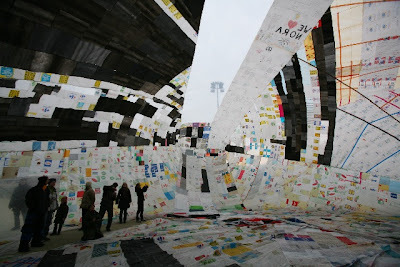 The project is a case study of sorts of artist Tomas Saraceno. Saraceno's floating museum is one part of a broader and ambitious vision of habitable platforms that float in the air. These platforms allow for sections of living space to join together "like clouds," forming aerial cities in motion. The artist explains "Like continental drift at the beginning of the world, the new cities will search for their positions in the air in order to find their place in the universe ..." For now, with feet firmly planted we can just relish in the surreal vision of Saraceno, and hope that his latest venture into fantasy lands, lands in a city near you. 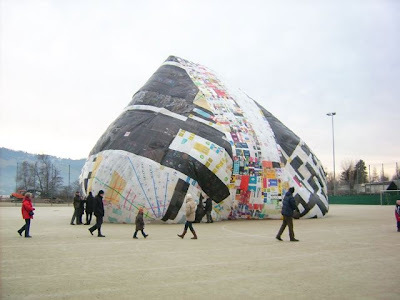 The Museo Aero Solar made its home from January 24-27, 2009 in Alte Fabrik Rapperswil in Jona Switzerland and is in Tirana Albania in Febriary 2008.